An animal cell diagram is a great way to learn and understand the many functions of an animal cell. The diagram, like the one above, will include labels of the major parts of an animal cell including the cell membrane, nucleus, ribosomes, mitochondria, vesicles, and cytosol. The cells of animals are the basic structural units for the wide variety of life we see in the animal kingdom. Animal cells are eukaryotic in nature, possessing a nucleus and organelles that carry out the different functions the cell must do to thrive and reproduce. Though both animal cells and plant cells are eukaryotic cells, the cells of animals differ in a few key ways. Animal cells have different organisms and parts to them, as opposed to plant cells. Let’s take an in-depth look at the different parts of animal cells and their functions. The cell membrane is what surrounds the cell, keeping its contents within it and separating it from the outside environment. The first prominent difference between animal cells and plant cells is visible here, animal cells don’t have cell walls, only cell membranes. The cell membrane is made out of a phospholipid bilayer. The phospholipid bilayer has a phosphate group for a head, with two fatty acid groups as tails. The effect of this arrangement is that the cell membrane is selectively permeable, only allowing specific substances to pass through it. Smaller molecules such as carbon dioxide and oxygen are capable of passing through the membrane, but larger molecules must enter the membrane through pores known as transmembrane channels. The cytosol refers to the gelatin-like liquid within the cell. The cytosol composition is mainly water, yet it contains many substances necessary for the cell’s operation, like proteins and potassium. When combined with the organelles inside of the cell, the cytosol and organelles are collectively referred to as cytoplasm. The cytoplasm has a large network of filaments running through it, called the cytoskeleton. The cytoskeleton’s job is to give stability and strength to the cell, helping it maintain its shape, much like the skeleton within the human body does. The nucleus is what contains the cell’s genetic material, its DNA. The nucleus controls the growth and replication of the cell, and the DNA within it makes proteins which control the activity of the rest of the body. The DNA that is found within the nucleus is tightly wound around structures known as histones to form the chromosomes used in replication. 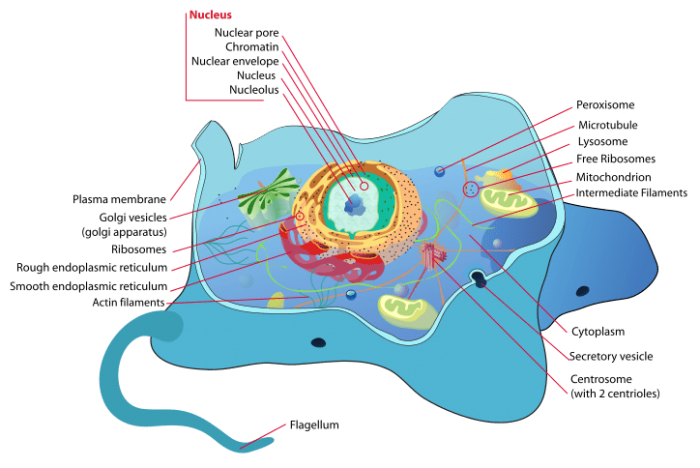 The nucleolus is a subsection of the nucleus, and it is where ribosomes are produced. The nucleus has a membrane around it, much like the cell itself does. 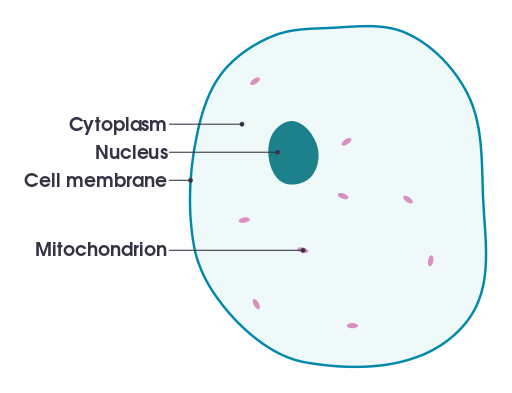 This membrane is referred to as the nuclear membrane, and it protects the DNA within the nucleus from exposure to the chemical processes going on in the rest of the cell. When the cell replicates, the nuclear envelope breaks down and the contents of the nucleus are expelled into the rest of the cell. Organelles referred to as centrosomes are responsible for organizing the DNA and preparing it to divide equally. As mentioned, ribosomes are synthesized within the nucleus of the cell. Ribosomes can be found in all types of cells, and they are responsible for creating proteins. This is done by mapping the instructions for a specific protein onto messenger RNA, or mRNA. The mRNA is then carried to the ribosome by transfer RNA (tRNA). The information encoded into the mRNA is then used to place the amino acids in the correct order, creating the right protein. Ribosomes can be found floating around in the cytoplasm of an animal cell or attached to portions of the rough endoplasmic reticulum. The endoplasmic reticulum is a long, winding network of sac referred to as cisternae. The cisternae come off the nuclear membrane, and the function of the endoplasmic reticulum is to transport and modify the proteins. There are two sections of the endoplasmic reticulum, the rough endoplasmic reticulum, and the smooth endoplasmic reticulum. The smooth ER doesn’t have ribosomes attached to it, while the rough ER does. The rough ER uses the sections of ribosomes attached to it to synthesize proteins. The smooth ER assists in the creation of lipids, and it also plays a role in the breakdown of toxic substances in the cell. Vesicles are spheres which enable the transportation of materials throughout the cell, moving goods from one organelle to another organelle. The lipid bilayer is also made out of vesicles. Vesicles come in different shapes and sizes, and specialized vesicles known as lysosomes are responsible for the breakdown of old and worn out cell parts. Lysosomes break down things like lipids and proteins, freeing up the macromolecules involved in them so that they can be recycled for use in other parts of the cell. Another job of the lysosome is to break down macromolecules that enter the cell. Plant cells typically don’t have lysosomes because they don’t need to break down foreign matter, as the cell wall does an adequate job of keeping it out. The mitochondria in a cell are responsible for providing the cell with its energy, earning the designation “the powerhouse of the cell”. Adenosine triphosphate, or ATP, is a form of energy the cell uses to carry out all its various functions. The mitochondria produce this ATP by breaking down fats and sugars, which are ingested when the animal eats food. Cellular respiration converts oxygen and sugar into ATP. While certain cells can produce ATP without oxygen, it is much less efficient than aerobic respiration (respiration using oxygen). The Golgi body, sometimes referred to as either the Golgi Apparatus or Golgi Complex, is responsible for the packing of proteins into vesicles. It’s sometimes said to be post office of a cell for this reason, as it sorts and folds proteins and sends them off to other organelles. The Golgi body is comprised of cisternae, much like the endoplasmic reticulum, but unlike the endoplasmic reticulum, the cisternae aren’t connected with each other. The organelles within the cell work together to form an intricate system capable of replicating and working together with other cells to form complex lifeforms.